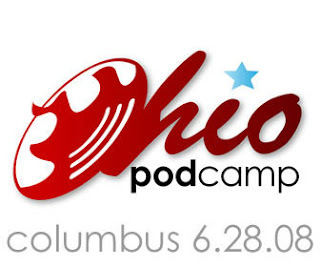 So what has happened at @podcampohio so far? Well, I just ate lunch and the rest of the day looks like it will be filled with a bunch of sessions that will be very useful. The biggest problem is that most of the sessions I want to attend are overlapping each other. I just ran a Speed Test on the internet here and it doesn't look like I'll be uploading anything here. I'll have to wait till I get back to my apartment tonight. I really wanted to get at least a picture or two posted but it look like the pipes just can take the number of people here. I definitely have some plans for the future. It mostly consists of spending money which isn't that exciting. Travis has the plan of starting an audio podcast. I have no problems with that as long as he does all of the editing. Editing a video podcast is enough work as is, I really don't need to do that much more. Spending an hour each week just talking isn't going to take up that much of my time. At a new media conference one would hope that you would be able to upload some media to the internet, but as it looks now I'll be uploading all night long. I've been waiting for Spore to be released for what seems like years now. I think I discovered it fairly early and watched all of the long form videos demoing the entire concept. I honestly built my current desktop with the requirement of being able to run Spore and not really anything else. I have already purchased the creature creator and have pre-ordered Spore which comes out on September 7, 2008. It was the digital download through EA so I'll be happily downloading it the day it is released. In the mean time, I have been, along with Cassie, having a blast making a wide variety of creatures. Spore is really clever in that it stores the creatures you make as tiny little images. So, just for fun I've posted a few of my favorites on this post. If you have the creature creator you can just download these images and load them into the game and you'll be able to interact and edit them! As a programmer I have to admit this concept is amazing. Having all of the information to render the creature stored in an image that actually looks like the creature is bringing the usability of this game down to a level that everyone can appreciate. 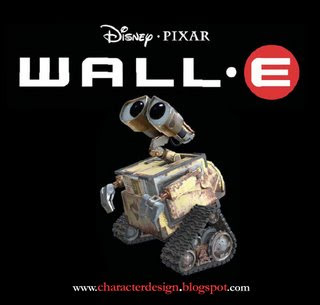 Mine looks like it is off of Meet the Robinsons and hers looks more like it is off of Toy Story. This is another one of Cassie's creations. It is a rendition of Gizmo off of Gremlins. I have uploaded a lot of the creatures I have made to Sporepedia and they can all be seen on my spore page. If I get the time I'll blog a little more about the different creatures I've attempted to make and the much better ones that Cassie has made. I woke up this morning to very exciting news in my RSS feed reader. I subscribe to new additions to Hulu and saw that two of my favorite shows are now available for viewing. (The Daily Show with Jon Stweart & The Colbert Report This is really, really exciting for me because I don't have Cable TV in my apartment. I now have an ever increasing number of ways to view my favorite shows on the internet very easily. While Hulu isn't the perfect video viewing option, it is still a very strong competitor. A downloaded-able version of the videos in a local client would be a much better option. While DRM free podcast like feeds would be great, I would settle for a DRM infested player that would allow my to download the episodes and view them at slightly higher resolution. Just my thoughts, I will definitely be watching Monday's episodes as soon as I get back from world. There is a big difference between being in classes full time and being on co-op working a full time job. During normal classes I'm always on my favorite websites in-between classes and keeping up-to-date on all of my important things. Yes, I admit to having email notifications on during class, but I only ever check my email if I noticed an important notification. I have found it really hard to keep up with my Google Reader. I subscribe to a TON of feeds and it wasn't uncommon for the past few weeks for me to have over 1000 items unread. Now, I've removed some things from my reader and it seems like things aren't as bad as they were for a bit. I also had some time the past few days and managed to go through my Facebook account and put my friends into group and add some restrictions on those people who I am just acquaintances with. Apparently it is rude to say no to someone when they try to friend you, but many of the people I have on Facebook I will likely never talk to again. I even managed to get through some backlogged banking and file maintenance the past few days. I really feel like I am up to date. The thing about this is, all of my important documents are on my Tablet and not on my desktop (don't worry, they are encrypted... twice) and I only feel like I have things up-to-date when I also feel like I've been using my Tablet a lot. I guess that is just intrinsic to where the files are stored. On another random note, I have started using Twitter via my cell phone. This is mainly because my cell phone plan was bumped up to unlimited texting because my younger brother doesn't know how to not go over. I now have a significantly higher volume of text messages sent to my cell phone. They are mainly from Facebook, my bank, and Twitter. I haven't really got into the habit of texting other humans except for Cassie. I was meaning to update STUG's website theme this weekend but that just proved to be too intimidating of a task for me to undertake. I will try to break it into smaller goals and see if I can't make some progress. I just wish FireBug was compatible with Firefox 3. I guess that about raps up my fairly random blog post. I've been meaning to post more but things are just so crazy it is hard to get to every thing I want to do each day. While this isn't finished, I thought I would post it anyway. This is the new intro for Tablet Tips. I think it is a great start. 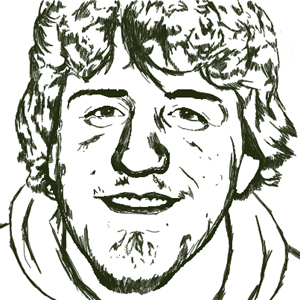 Now I need to start working on the outro. Cassie did a lot of work to get this intro finished. The stop motion animation of the Tablet PC was her idea and she did a lot of work to get it from an idea to an actual video. I was curious as to how much bandwidth I actually use. 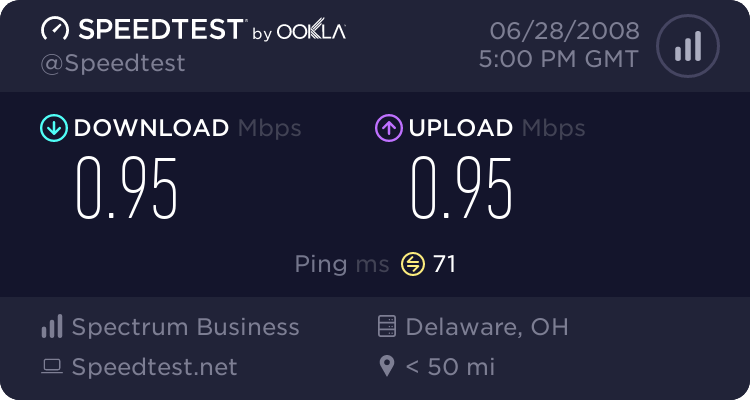 Since I am no longer on the amazingly fast dorm room connection at UofL I thought I would do a little test. And by test, I mean 1 month long test. I installed NetLimited on my desktop, my main computer. While this test didn't measure the actual total amount of bandwidth I have used in a month, it is fairly close. I have been using my laptop a limited amount, the Wii doesn't use that much, and my Skype Phone isn't used enough to make a sizable impact. What this is really measuring is my big uploads and downloads. I am a HUGE consumer of online video. I subscribe to over 30 podcasts and will regularly stream content from YouTube and Hulu. The regular big downloads for me come from Revision3 and my other podcasts I watch. Many of them approach 300MB in file size. I am a fan of the HD versions, the look great on my computer screens. In addition to all of the free content I download, I have started renting moves from Amazon Unboxed. The download is typically fast enough to start watching a move in less than 3-5 minutes. My uploading is actually higher than my downloading. Most people may be suspicious of this, but since I use Carbonite to backup all of my documents, including some rather large files, it does add up. I uploaded 51GB of data to Carbonite in the month of May. Now, you may be asking where all of these large files come from. Just because I am a big consumer of internet content doesn't mean I am also not a big publisher as well. I have my digital camera and a Flickr account. This means I end up doing some major uploading from time to time. For example I just uploaded 360 pictures of the Kentucky High School State Track Meet yesterday. In addition to uploading pictures, I upload video on a regular basis. Between Tablet Tips and uploading random videos to my personal YouTube account, it starts to add up. Take into account those videos are uploaded twice, once for the upload and once to Carbonite, it makes sense I upload more than I download. My internet upload speed tends to be saturated for long periods of time while I push my content into the cloud. 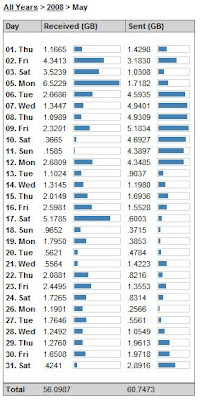 The interesting thing to notice are the days where the upload is always almost 5 GB. This just happens to be Carbonite's daily limit. I am probably an exception to the standard person primarily because of my use of online backup. However, I still think that this information was interesting enough to publish.